President Trump, who’s been dealing with smart alecks making fun of his gerbil hands since he was a fixture in Spy magazine, made a show of not being able to fit into a pair of rubber gloves on Thursday, the second time he’s done so in as many weeks. 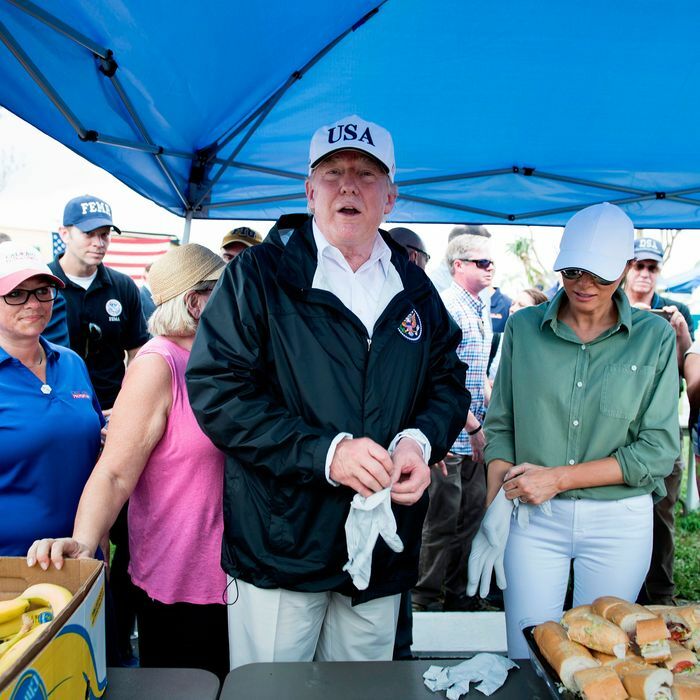 During his trip to hurricane-ravaged Naples, Florida, Trump, along with the First Lady, vice-president, and others, passed out lunch to people working to clean up the coastal town. According to the White House pool report, Trump positioned himself behind a tray of sandwiches, where he attempted to put on a pair of rubber gloves. He struggled to fit them over his mitts, declaring, “They’re too small.” After the glove on his right hand ripped, Trump decided to recommend hoagies rather than actually pass them out. “Here’s a nice one,” he told one diner. Many members of the Trump administration have been criticized for their incompetence, perhaps no one more than Trump himself, but if there’s one person who’s clearly doing their job, it’s the aide who has apparently been tasked with following Trump to disaster zones and replacing all the regular-size rubber gloves with those made for children.